Regional markets slumped, led by HSSI (-4.2%), ASX 200 (-3.7%), JCI (-2.6%) and KOSPI (-1.8%), spooked by worries about absence of permanent solution to the Euro zone and mounting fears of a Greek default. Compounding that is the possible Moody’s downgrade of French largest banks (due to their huge exposures to Greek holdings) this week. Tracking the regional fears, FBM KLCI tumbled 1.6% to 1446.3, the steepest single day loss since 9 Aug’s 1.7%, weighed by losses in GENTING (-30 sen to RM9.47), IOICORP (-15 sen to RM4.63), TENAGA (-15 sen to RM5.14), CIMB (-10 sen to RM7.06) and PETCHEM (-16 sen to RM6.24). Signs of contagion from the potential Greek default and any news of downgrade on top banks in Europe will garner investors’ attention as disorderly series of events would likely make matters much worse for the remaining four PIIGS. Hence, we continue to advocate investors to stay defensive or sidelines. Alternatively, for risk-takers, adopt a short term trading oriented approach to buy on sharp falls in share prices and sell into any rebound. 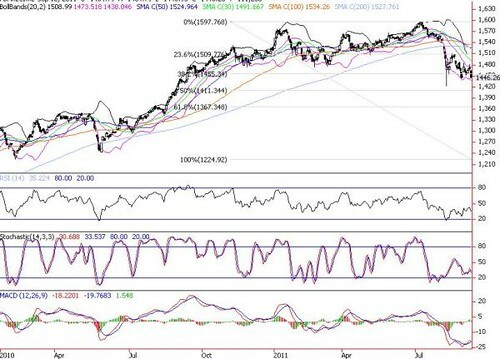 Weekly supports are 1438 (lower Bollinger band), 1423 (YTD low) and 1411 (50% FR) whilst resistance zones are situated near 1474 (mid Bollinger band), 1492 (30-d SMA) and the 1500 psychological mark.